Above all, brownies for us come with heart and care. We loved them from the start and continue to hand make brownies as a labour of love daily and ship them across Australia and often to the world. Brownies to us here are nothing but goodness. So with the increasing focus, there’s really no wonder why brownies are often the subject of kitchen experiments. You probably have tried making your own brownies many times. But if you feel like something is not quite right you could be doing any of these most common brownie-making errors. Dont think all chocolates are the same. If you want to come up with really delicious brownies, one of the most important things to ask yourself is what chocolate you should use. Remember that brownies don’t require a lot of ingredients, so you have to make sure each one of them is of good quality. Keep in mind that there are many types of chocolates and they differ in taste, richness, texture, melting point, and processes used to make them. You can always experiment with different types and brands of chocolates. They key is to always go for the good stuff. 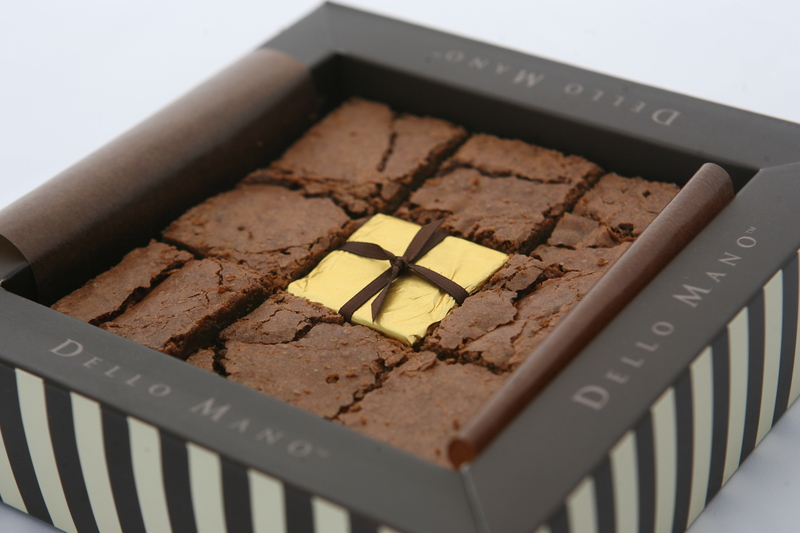 Dello Mano brownies are made using the finest quality of Belgian chocolates as we believe it makes rich and really enticing handmade brownies. Take care with the added flavours to your brownies. There’s nothing wrong with experimenting with different flavours for your brownie recipe. You probably tried using nuts, peanut butter, cream cheese, and lots more. But keep in mind that your main goal is to boost the flavour of the chocolate, not mask it. What makes brownies “brownies” are their rich chocolate flavour. The new ingredient you add shouldn’t take the chocolate goodness away. Use the right brownie recipe. Don’t think that any brownie recipe will do. While the main ingredients are very few, the amount used in the recipe, as well as the baking processes involved, have an effect on the taste, texture and quality of your brownies. It is important to consider what type of brownie you want. Is it cakey, fudgy or chewy? This makes finding a good brownie recipe easier. And of course you need to decide on a great quality cocoa powder or chocolate. When it comes to baking, the quality of ingredients should be a priority. In brownies, there are a very few on the list – butter, eggs, chocolates and flour. And because of this, much of the flavour of your brownies will depend on the taste and quality of your ingredients. So always go for the best that is available in your local area. In the Dello Mano kitchen, we bake brownies using real butter, , free range eggs delivered direct from the farm, and the finest Belgian chocolate. All these are lovingly blended in our own brownie recipe that emphasizes exquisite flavours and results in our decadent and elegant brownie gifts. Making your own brownies is really fun. And if you want to be extra happy with the result, get away from these top brownie making mistakes. Take a look at our other brownie tips. Got any tips on baking or brownies you’d like to share – love to hear from you? Next postBlondie or Brownie: What’s the Difference?